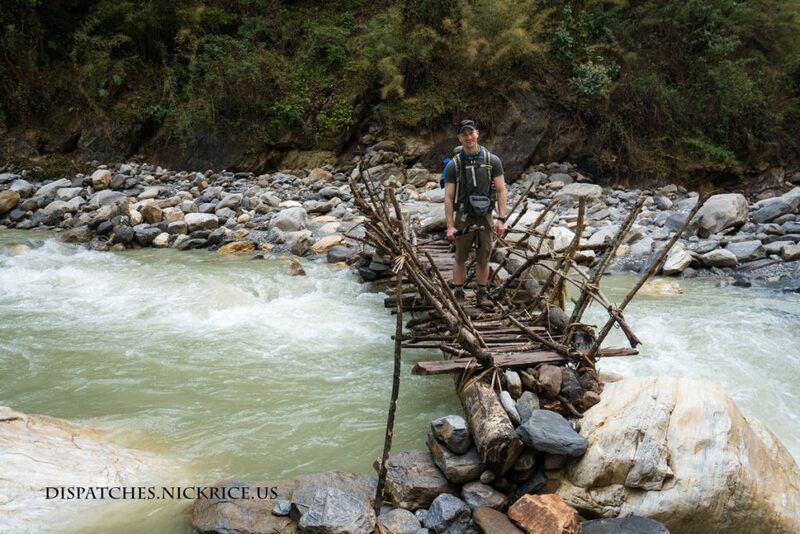 Nicholas Rice will depart Los Angeles for Kathmandu, Nepal on April 5th, 2018 for his 14th Himalayan expedition and his 17th major international expedition. 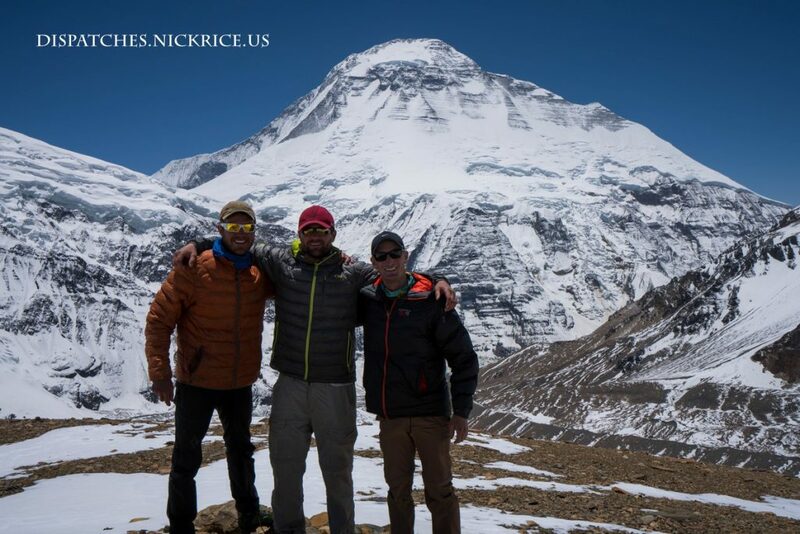 Nick will be attempting to climb Dhaulagiri via the Northeast Ridge with Lina Quesada Castro (Spain) and Ryan Kushner (USA), and Christopher Manning (Canada). 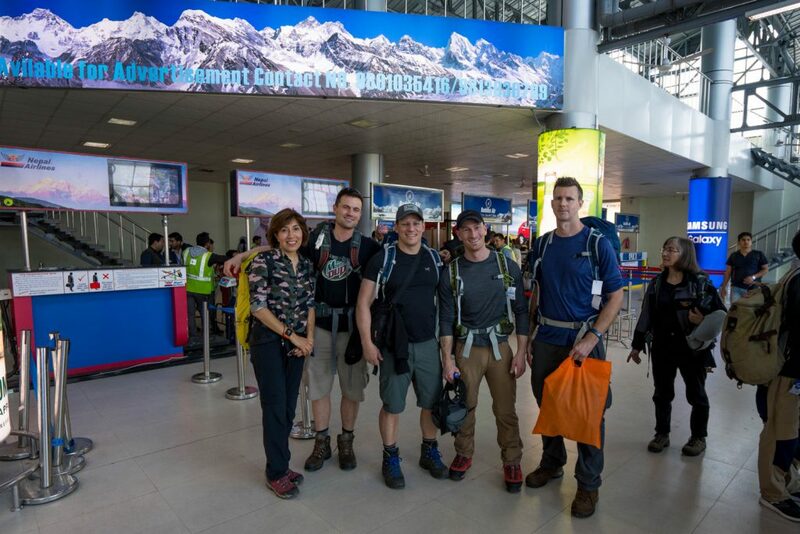 The climbing team will be joined with trekking members Jeremy Hoisak (Canada), Wendy Knowles (USA) and Simon Weaver (UK) who will trek to base camp as well as scale Thapa Peak (19,685ft or 6000 meters). 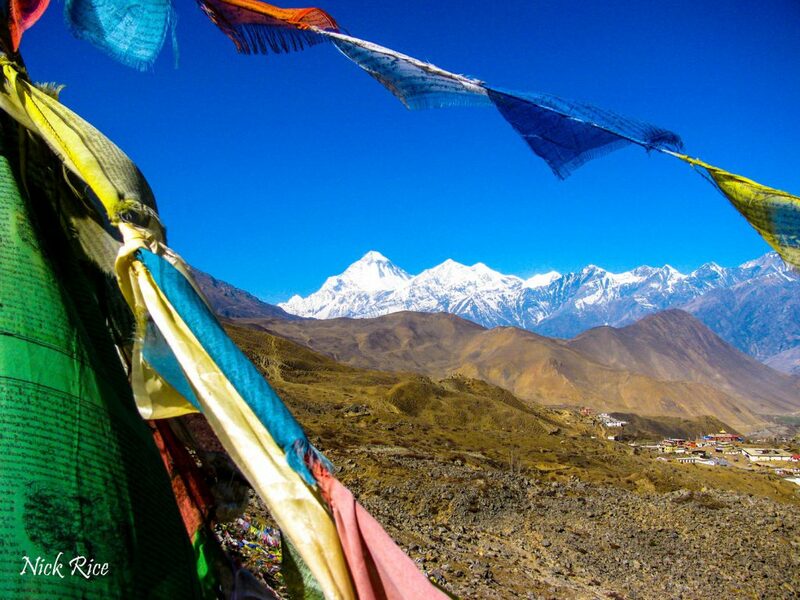 Dhaulagiri is 7th highest mountain in the world standing at an elevation of 8,167 metres (26,795 ft) above sea level. 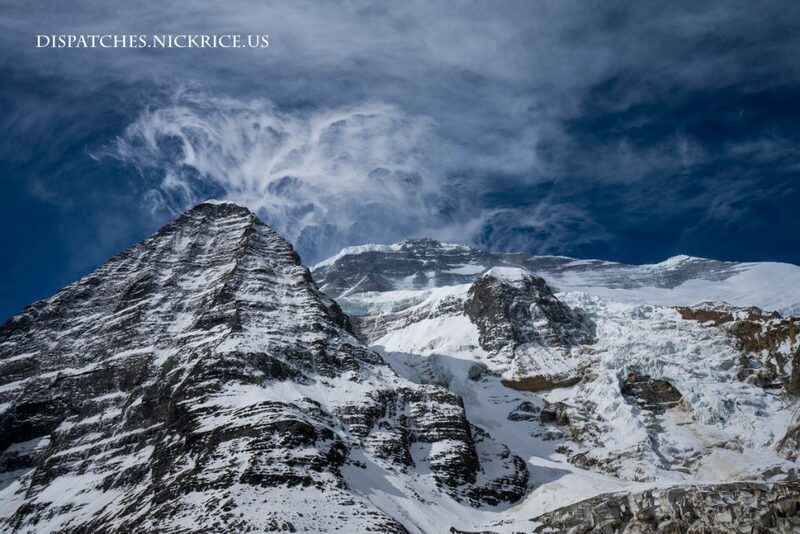 It was first climbed on May 13, 1960 by a Swiss/Austrian/Nepali expedition. 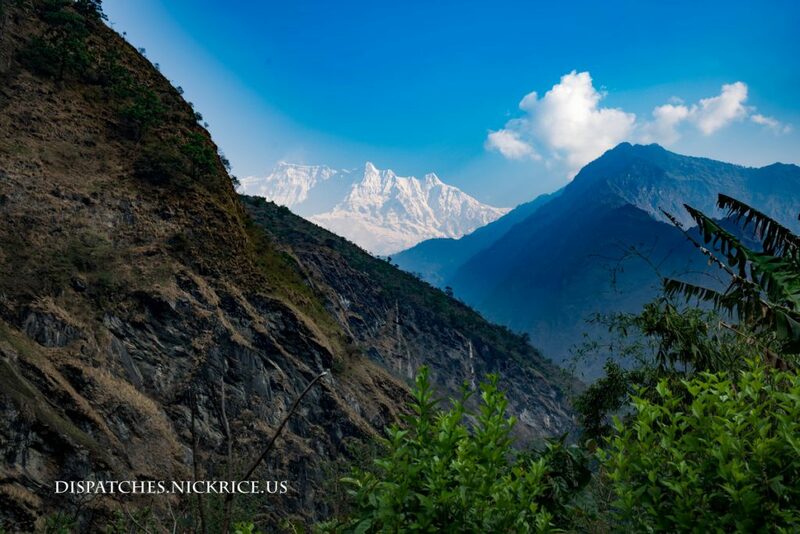 The mountain’s name is धौलागिरी (dhaulāgirī) in Nepali. This comes from Sanskrit where धवल (dhawala) means dazzling, white, beautiful and गिरि (giri) means mountain. 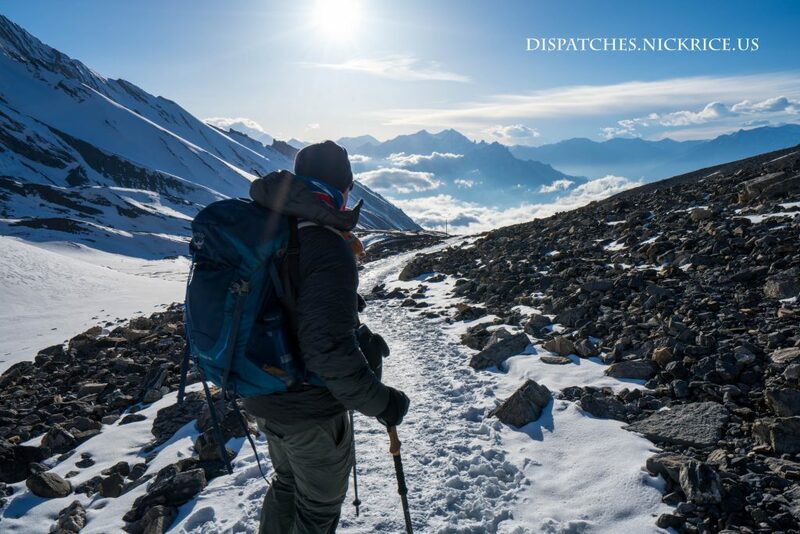 Dispatches will be posted live from base camp via satellite modem as the expedition progresses. 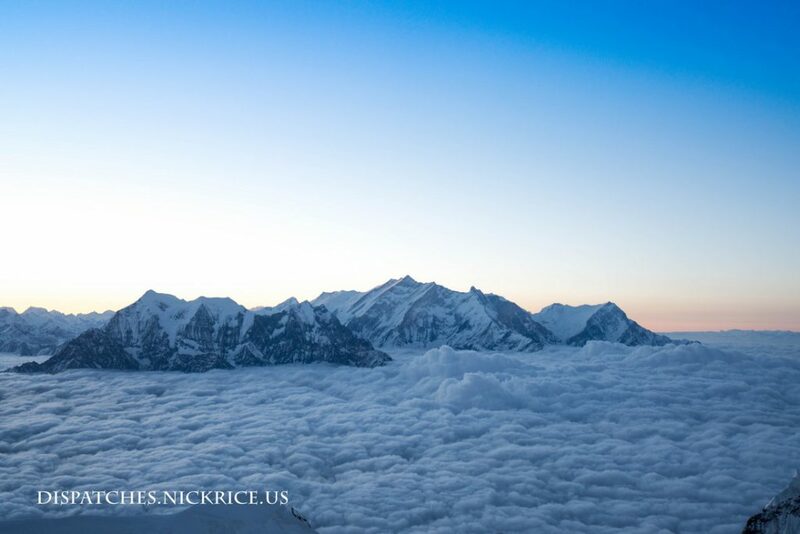 Many of you read my reports of extremely high winds on our summit bid as we approached Camp III this Spring season on Dhaulagiri. Below is a video I took shortly before turning around close to 24,000ft. Today, I woke up buried in my tent. I used my pot to dig out a hole large enough to allow me to get out and spent the next few hours digging out my tent. I made water and breakfast and watched as a steady stream of climbers descended from Camp III. 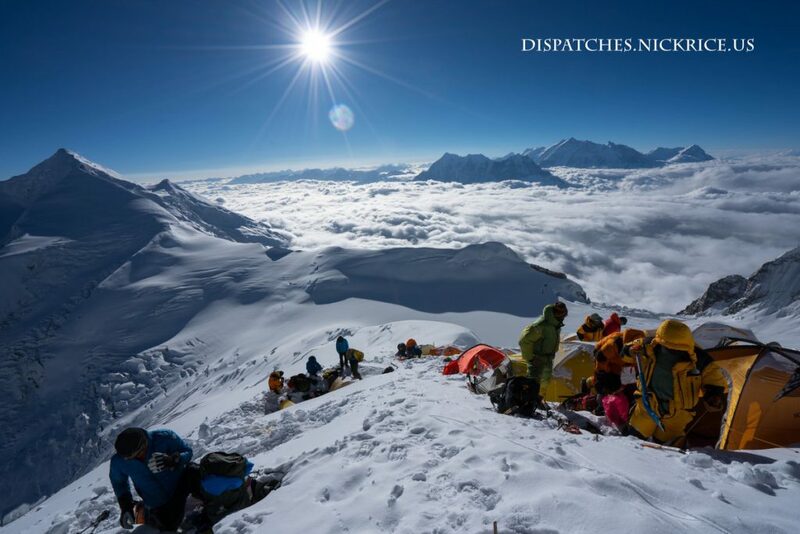 All of Carlos Soria’s expedition descended, and their Sherpas opened the valves on their oxygen bottles, signaling the end of their expedition. 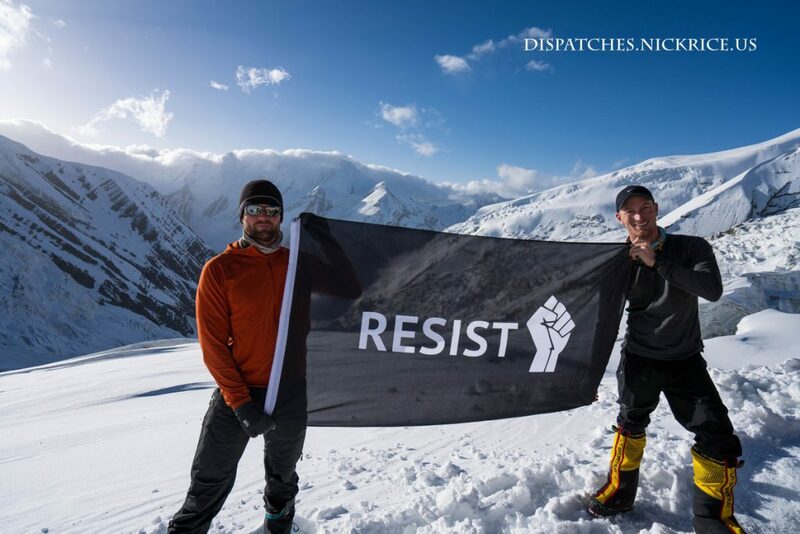 It was clear from the conversations that I had with everyone descending, that this was not just a hiccup, but a definitive end to their summit attempts on this mountain. I was disappointed because I had formulated a plan to summit, descending today to Camp I where my body would better be able to acclimate and recover, then ascend to Camp II Saturday, ascend to Camp III Sunday, and attempt the summit on Sunday night into Monday morning. 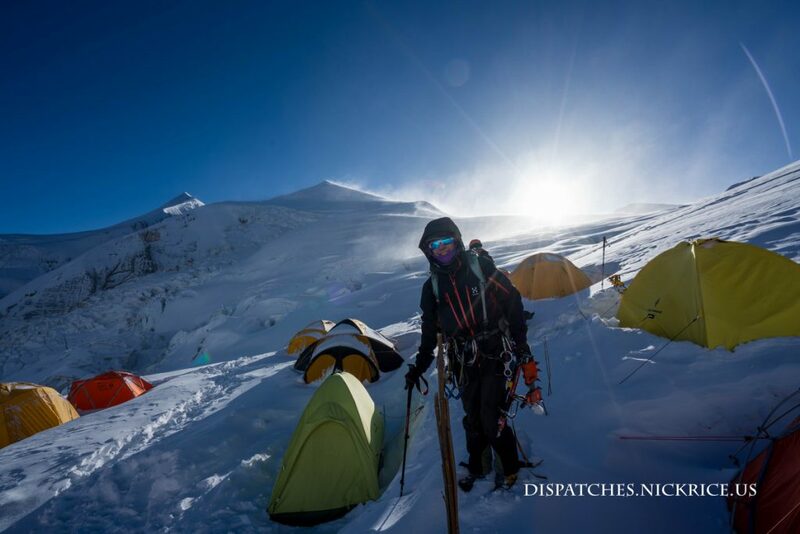 The winds these days were forecast to be significantly lower and the extra days would provide us the opportunity to acclimatize better than we would have been able to with a Friday summit. I sent a message to Chris in the early morning asking about their plans, but didn’t received an answer until it was too late to leave for Camp III. They indicated that they would try to go for the summit in the evening. With no one left to attempt the summit with, and with my injured leg, I decided to descend in the afternoon to Camp I, where I could still mount a summit attempt, but would be able to rest better. I arrived in the late afternoon. Along the way to Camp I, my leg became so painful that I had to stop. I sat on my backpack and almost vomited from the pain. Fortunately, I had packed my first aid kit, which had some very powerful analgesics inside. I took one and continued the remaining way down to Camp I. It became apparent to me that without a somewhat large group of climbers with me on Sunday night/Monday morning, it would be unwise to attempt the summit in my current condition. After making dinner, I made the decision to descend to base camp the following day. 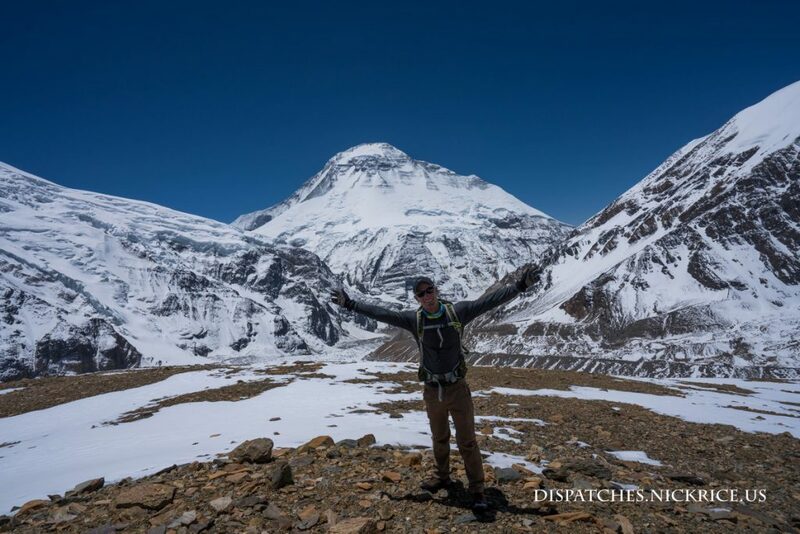 Despite the upcoming days of good weather, I realized that Dhaulagiri demands every ounce of strength for a summit attempt, and I would be a fool to attempt this mountain in anything but the best physical and mental condition. I also began to realize that my ability to enjoy my time on the mountain was being hampered by my nagging injury. We don’t pay thousands of dollars to come here just to suffer. 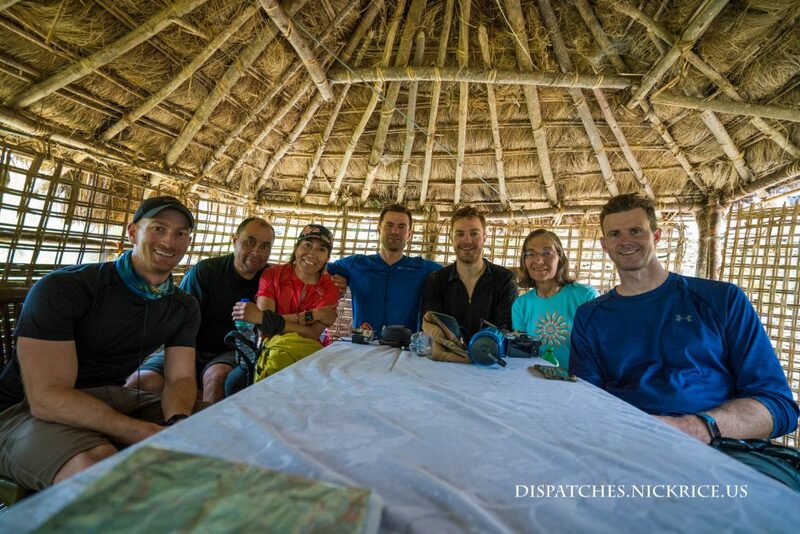 Yes, suffering is definitely a factor in every expedition, but it is most often offset by the beautiful views we get to enjoy, the strong relationships we form with one another, and the personal growth we experience as we push past our fears and physical limits. In this case, the distraction of my leg was taking me away from my experience. All things considered, I decided to end my expedition. I went to sleep in Camp I, shooting pain descending my leg, and woke up at 11:00pm to the news that Ryan, Chris, Lina and Eva were going to attempt the summit in the night. 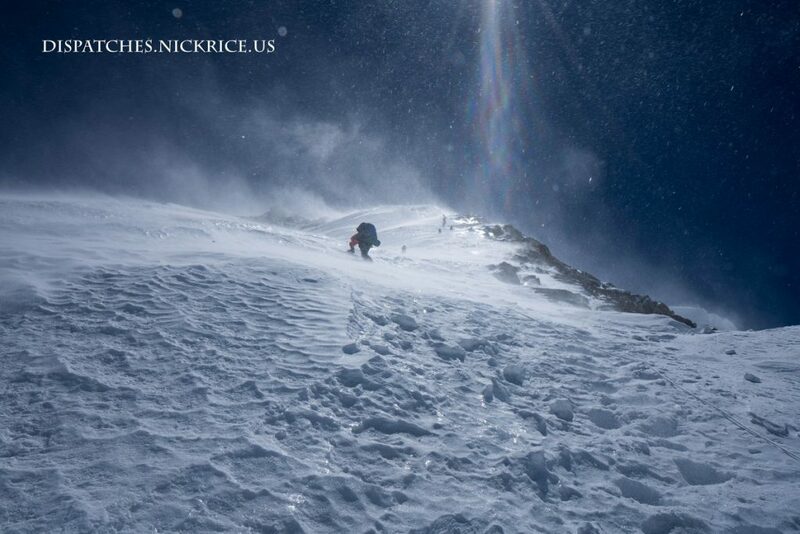 High winds blast Dhaulagiri's upper slopes as we climb toward Camp III. Today, we woke up at 4:00am and began making water. Since Lina had lost her stove in the tent of another Andalusian team, she joined us in our tent. We made her water for her bottles and for breakfast and took her deposit for Camp II from her before she departed for Camp III. After she left, we continued making water and breakfast for ourselves. We finally got ourselves packed and Chris left around 8:00am. I remained behind for a bit so that I could further reinforce our tent anchors, as I knew that Camp II could get quite windy. I left for Camp III around 9:00am. The route from Camp II to Camp III was quite steep and very icy, and the awkward angles that were required for my feet to make aggravated my leg injury. A few hours into the climb, I stopped to take an anti-inflammatory pill which took the edge off enough for me to continue. 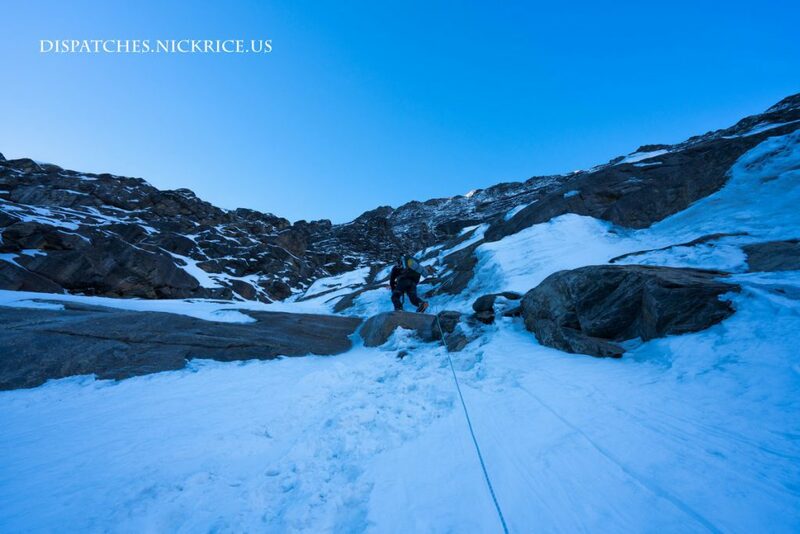 On a mixed section, I heard a snap in my leg as my crampon slipped on a piece of blue ice. The pain was horrible, but I kept moving up the slope slowly. As I reached 7100m, the wind began to pick up, blasting me with spindrift which entered anywhere it could, be it inside my gloves or behind my glasses. I looked up and noticed that the entire upper mountain was being blasted with winds that far exceeded our forecast. The location of Camp III was also being blasted, and I began to consider my options. We were all wearing our down suits on the way to Camp III. The fact that I was cold while moving and wearing my summit gear did not bode well for my condition when arriving to Camp III. I knew I would have to spend more than an hour carving out a small tent platform when I arrived to Camp III. Pitching a tent in these winds would be a challenge, and the tents would require extensive anchoring in order to be secure. I also had just passed the location where Simone had died and considered the fact that everyone was heading up into horrible weather (that wasn’t forecast) counting on low winds that evening (that were forecast) for a summit bid. 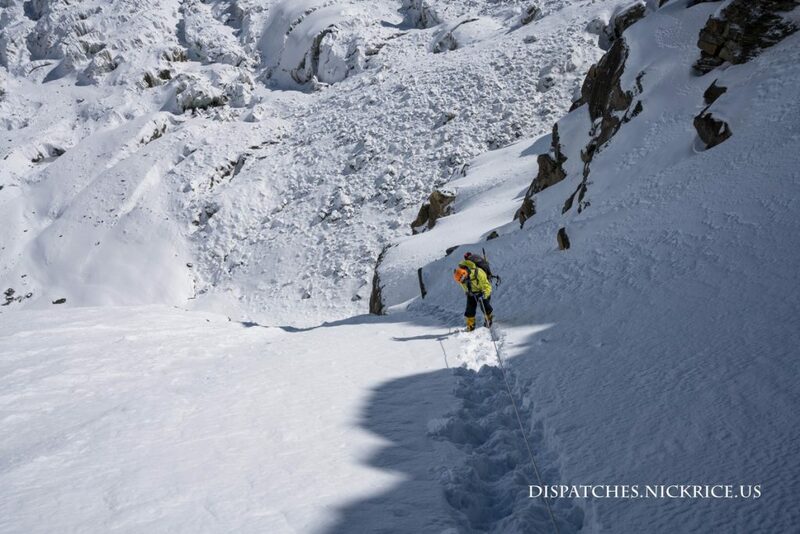 I weighed my options and decided to descend, despite being only around 100 meters from Camp III. 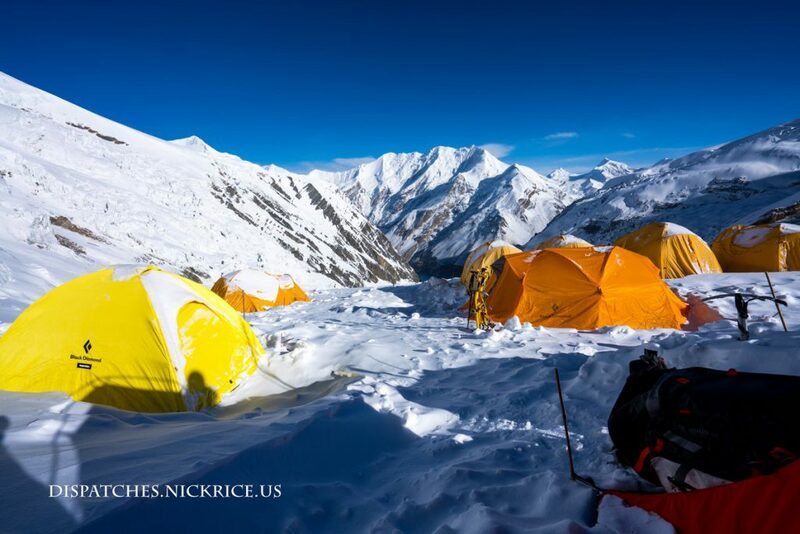 I knew that if I arrived to Camp III cold and exhausted, dug a tent platform in high winds and cold temperatures and didn’t get inside my tent till after 6pm, I would have almost no chance at having the energy for a summit bid later that evening. I sent a message to Chris informing him of my decision and gave him around 20 minutes to respond. 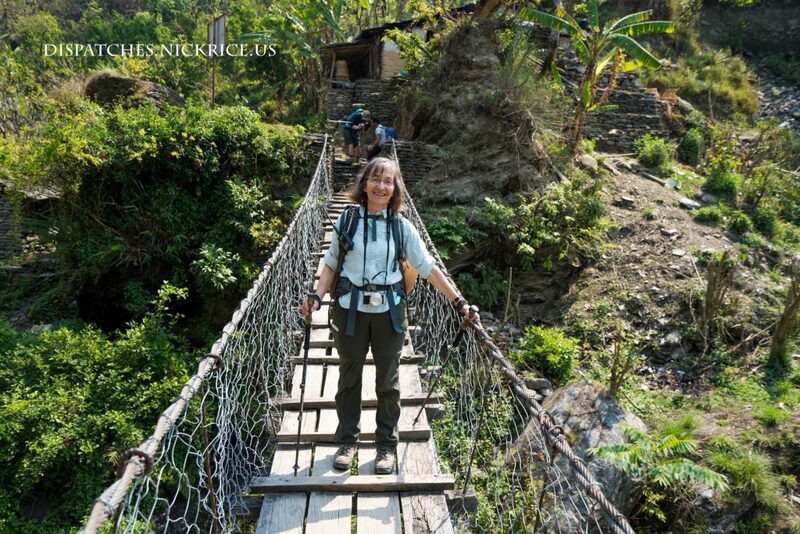 When I didn’t hear from him, I began rappelling down to Camp II, my leg bothering me the entire way down. 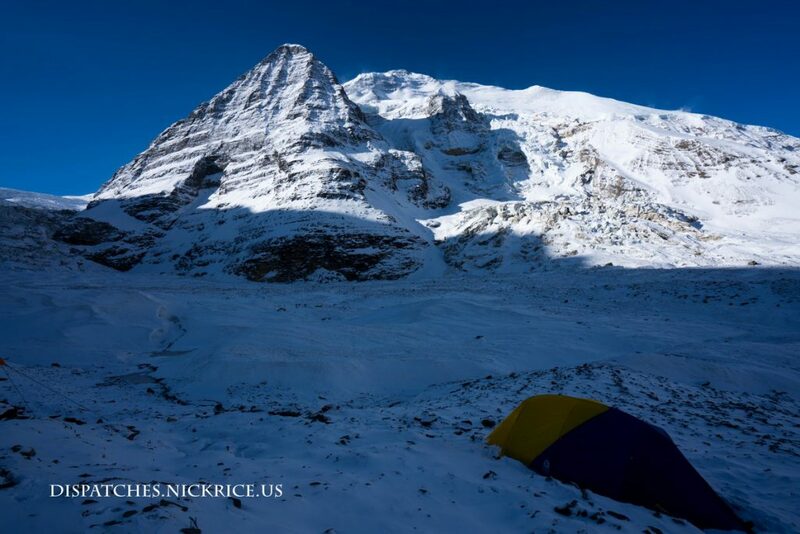 I reached Camp II at 4:30pm and quickly climbed into my tent and out of the constant wind. I made water, ate dinner, and again tried to contact Chris and Ryan to confirm that they had gotten my message. I got confirmation that they were in Camp III but didn’t hear news of Badia and Mauricio. I worried as I knew that they were ahead of me, but were still not in Camp III. I made the assumption that they had arrived but that Chris hadn’t responded yet to my message (perhaps his inreach was off). 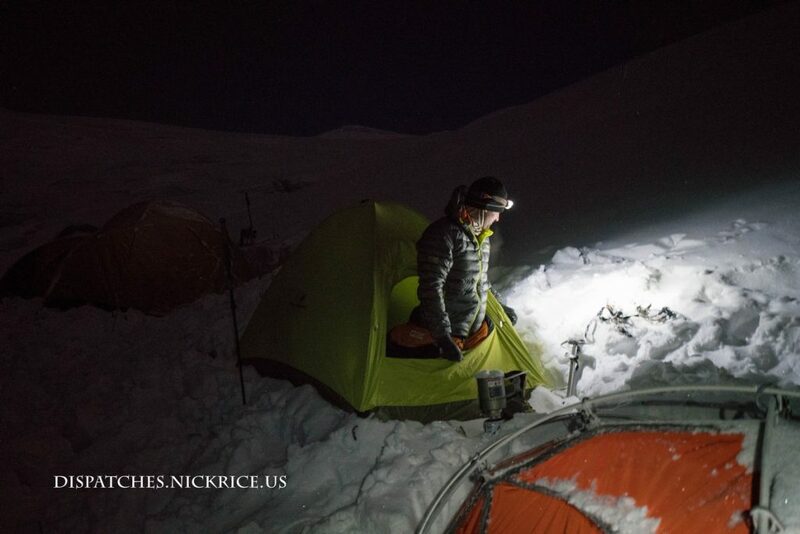 I made water and dinner, and tried to get some sleep while high winds began to bury my tent in the newly fallen snow. I slept with my knife in my hand so that if the tent collapsed under the pressure of the snow that was being piled onto the uphill side, I could carve my way out the other side. The high winds and low humidity caused electrical arcs to form on the inside of my tent, making for a very poor night of sleep. Today, we woke up early, packed up our things, and started up towards Camp I. Along the way, Dhaula (the dog) chased after me on the glacier, playing the entire way. She made it all the way to the Eiger, jumping two enormous crevasses along the way. 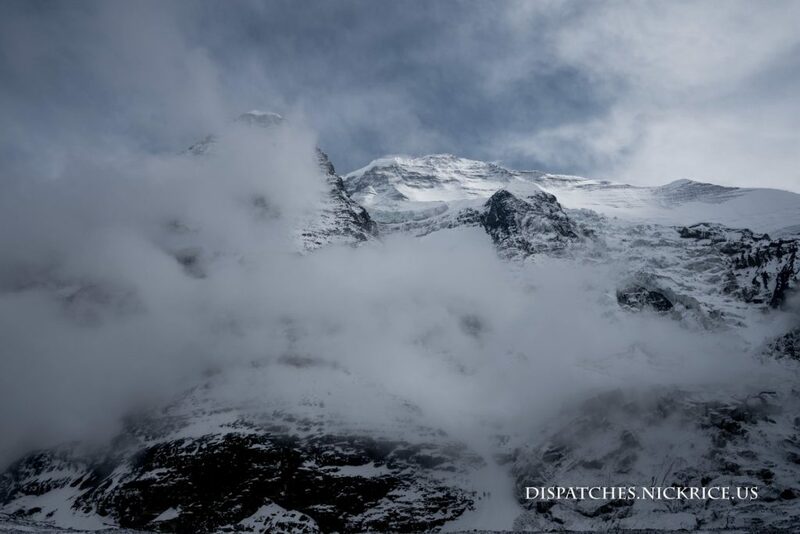 I spoke for some time to the journalist from Desnivel about her history and then said my goodbyes as I started up the very steep section up the Eiger. She was of course unable to follow, so I watched her make her way back to base camp. I made quick progress toward Camp I, arriving in the late morning. Chris and I spent at least an hour digging out our now buried Camp I tent. Afterwards, we settled in, made water and food, and rested in the warm afternoon before the sun dipped behind the surrounding peaks and the temperature dropped precipitously. The evening brought some light snow, but it wasn’t enough to interfere with our plans to climb to Camp II the following day. Last night, after dinner, Lina, Chris and I decided not to go up to Camp I today as the weather was still not good, and we saw little value in spending additional days up high on our summit bid, as we would be burning through fuel and food, and our bodies would be losing power. We instead decided to go up tomorrow with the aim of summitting on the 18th remaining the same. 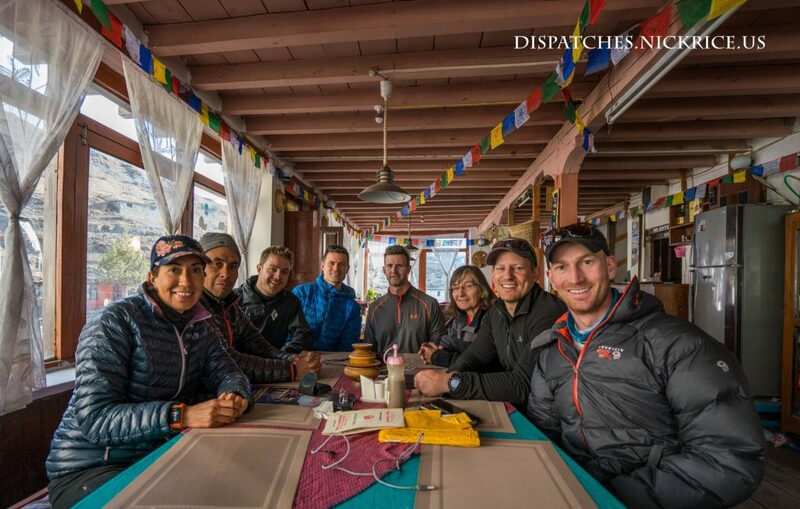 The day brought non-stop snow in base camp, and Ryan, Badia, and Mauricio (who did go up to Camp I this morning) confirmed during our evening radio call that around 40cm of snow had fallen in Camp I. 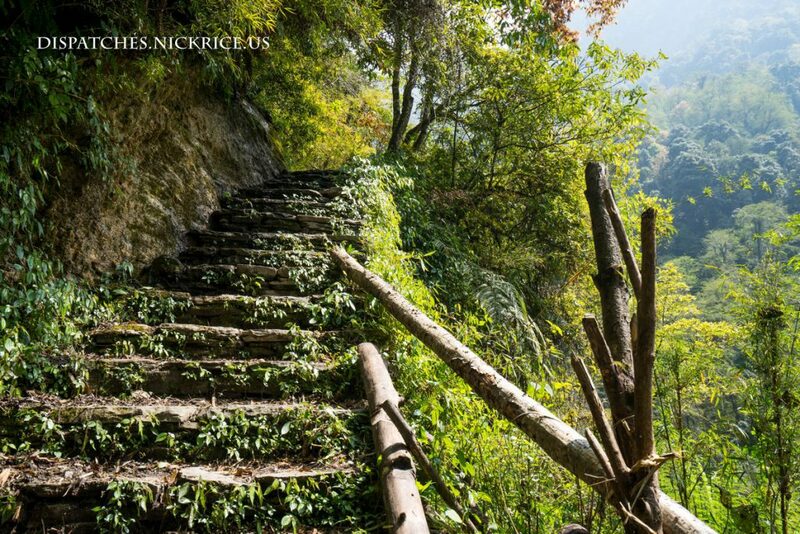 They had planned on climbing to Camp II and descending for another night in Camp I. Despite the new snow, we will still go up to Camp I tomorrow since this may be our only weather window. The wait for the summit window continued during these days. We passed the time playing card games, reading, and visiting with other base camps. 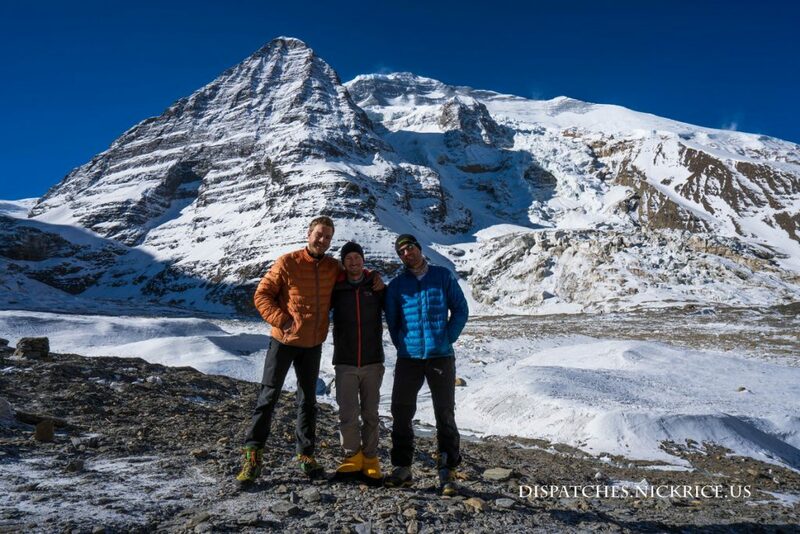 On May 11th, we decided to walk toward French Pass and climb a small hill close to the pass in order to maintain our fitness and acclimatization. Everyone in base camp is anxious as we watch good days go by with little to no activity on the mountain. Our plan is to begin our summit bid on Monday, May 14th, climbing to Camp I. We will then ascend to Camp II where we will take a second rest day. We will leave Camp II for Camp III on the 17th of May and attempt the summit on the 18th of May, assuming the weather doesn’t change. The weather after this remains good enough for contingency days and for our descent. 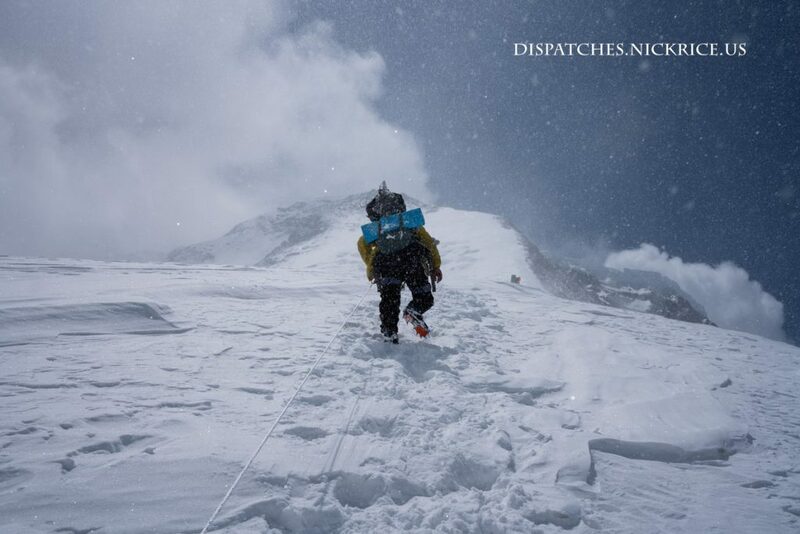 The evening brought snow and lightning on May 13th, adding to the anxious mood in base camp. Lina, Chris, Javi and Nick playing cards in the mess tent with Ryan reading in the background. Today, we woke up to around a foot of new snow in base camp. Our new forecast calls for extremely high winds low on the mountain tonight through tomorrow morning, so we had no choice but to push off our summit bid by at least a day, as it wouldn’t be safe to climb to Camp I in such high winds. 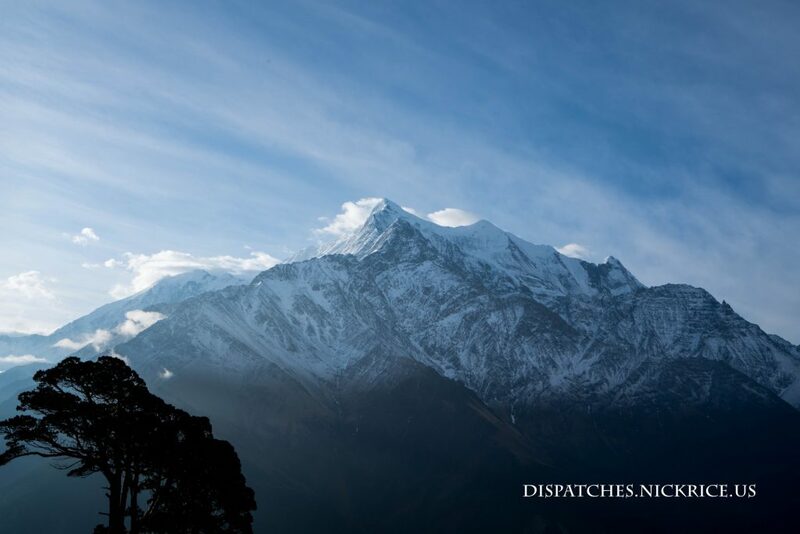 The weather window seems to be holding though, as low winds continue through the upcoming week, so we are hopeful that we will have a chance to get high on Dhaulagiri this cycle, and possibly attempt the summit. In the mess tent, I discovered a bag of cheeses that I had packed for my upcoming climb had been broken into by some animal, most likely a pika mouse. I secured my remaining food, and figured that considering the low temperatures and high winds, the mouse probably needed the calories more than I did. We spent the rest of the morning playing cards and reading, then had lunch. 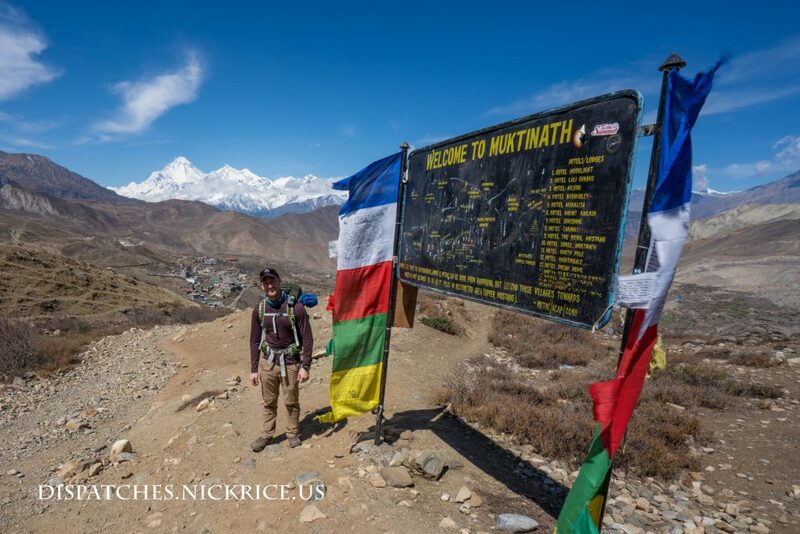 Afterwards, we had a visit from a very adventurous German family who was trekking the Dhaulagiri circuit. The afternoon brought the usual gloomy weather and winds began to increase as the afternoon turned to evening. We have pushed off our departure to Camp I tentatively to the 12th of May. Hopefully the weather report won’t change significantly before then. 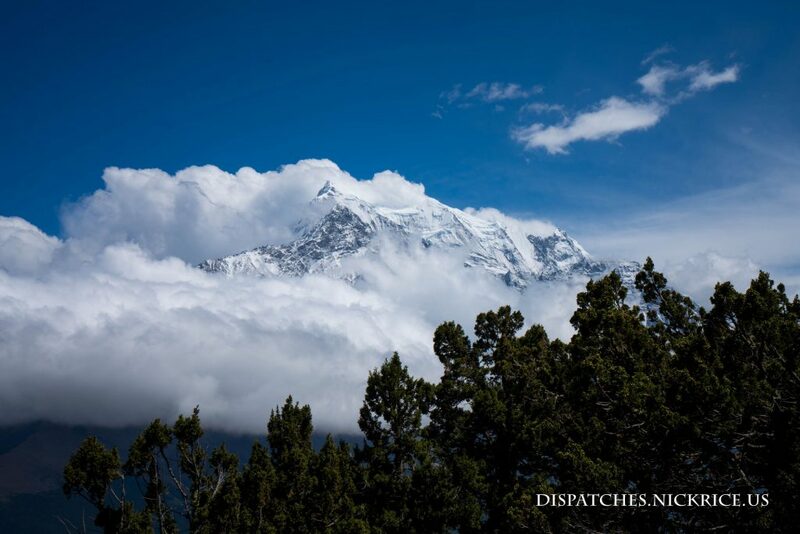 Dhaulagiri blasted by high winds. I combined these dispatches since these days were relatively uneventful. We have had intense winds and heavy snow in base camp. Many of our already old tents in base camp have broken, and there have been many sleepless nights as winds gusting as high as 50 mph/80kph have rattled our camp all night. 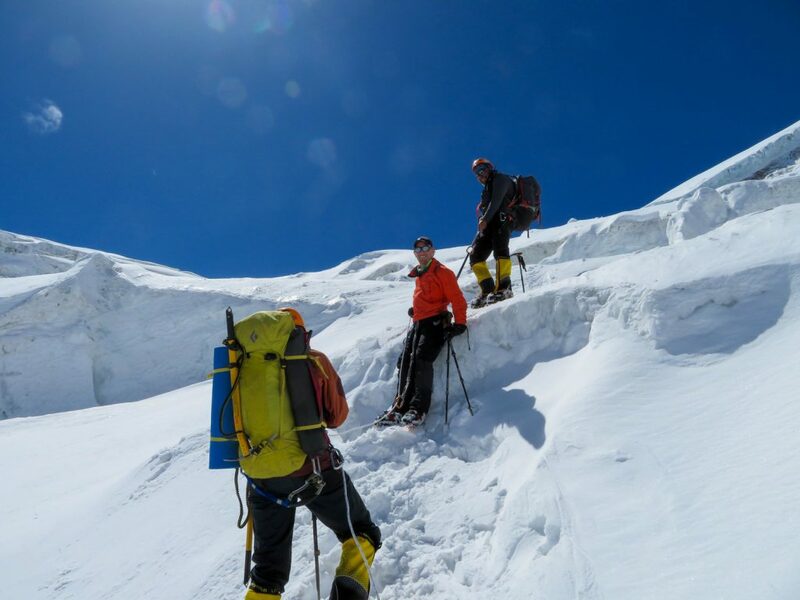 We have light at the end of the tunnel, however, as there may be a window for a summit attempt or another acclimatization cycle, depending on our condition in Camp III in the coming days. 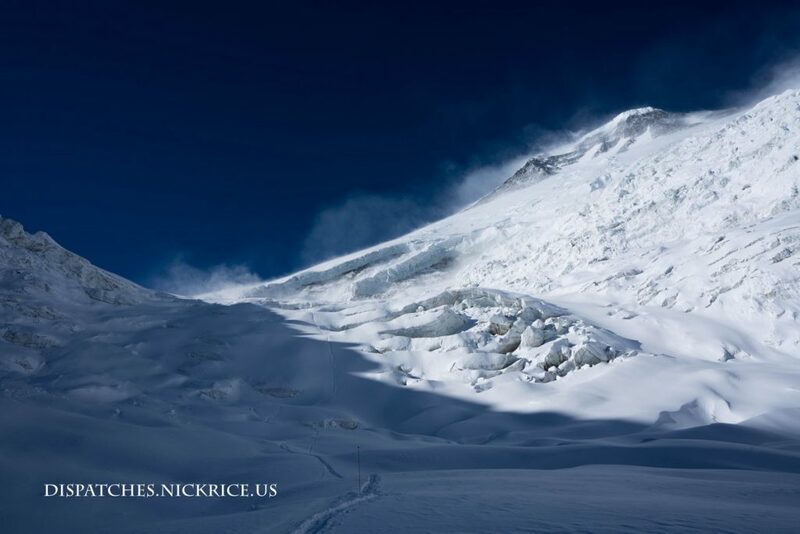 We plan tentatively to climb to Camp I on the 11th, Camp II on the 12th, Camp III on the 13th, and depending on our condition, remain a day to rest in Camp III on the 14th or attempt the summit on the 14th. This plan of course is contingent on us feeling good at each camp, and on the weather window remaining good as the days in question are quite far off and our confidence in the weather report is low. Dhaulagiri blasted by high winds viewed from the plateau below Camp I on descent. 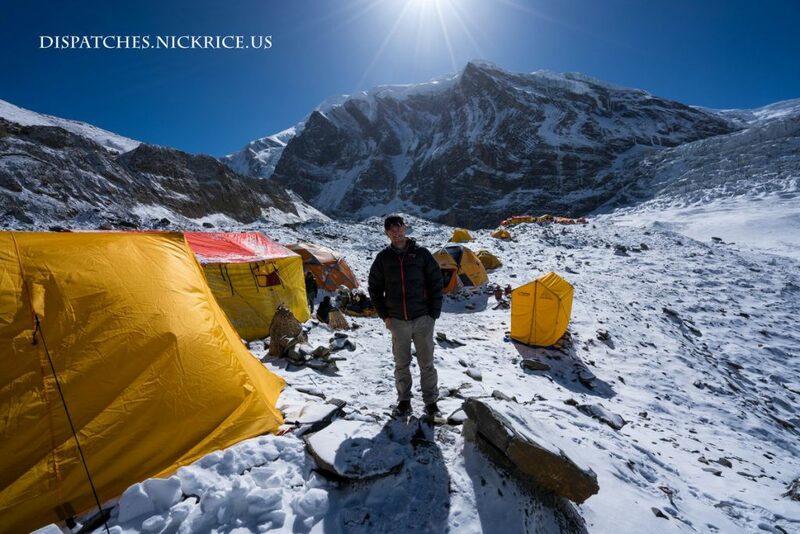 Today, we woke up at 5:00am, ate a small breakfast in our icy tents, and packed our things for the descent. We began descending at 6:30am in high winds, struggling to keep up a fast pace to bring back circulation to our frozen hands. We made it down to the traverse in an hour and quickly passed through the dangerous sections before the rappel. We arrived to our very snowy base camp in time for breakfast. Ryan broke trail the entire way through deep snow. The winds even at altitudes as low as Camp I far exceeded the forecast wind speeds. We made the right decision in descending, as to climb up to Camp II in these winds would have been hazardous, not to mention the accumulation of new snow that had fallen the previous day. 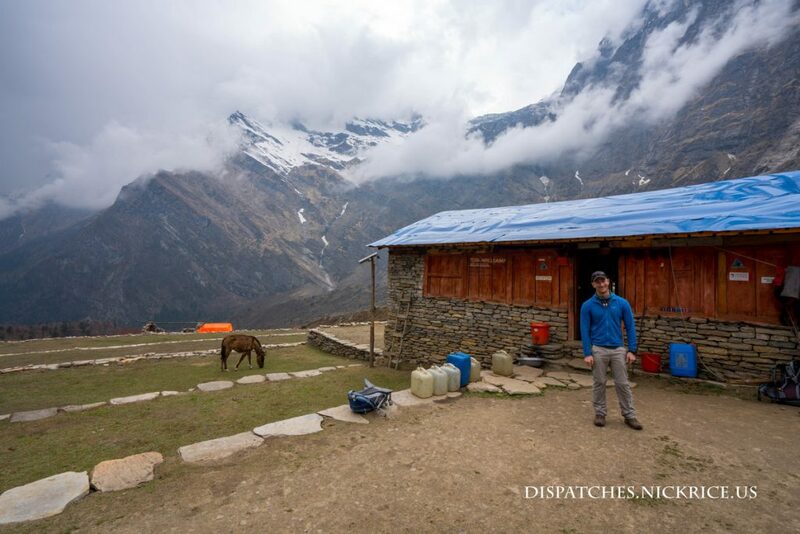 We took showers and watched as the usual weather moved in and snow fell again in base camp. My leg was fine on the way up, however, was quite painful on descent. I had a hard time sleeping in the evening and finally had to take an NSAID and muscle relaxant in order to sleep. Today, we woke up at 5:00am and checked conditions. As we had feared, a large amount of snow had already fallen and it began snowing again shortly after we woke up. It appeared that the forecast that called for heavy snow was correct (the forecast called for 19cm in the afternoon alone). We decided to remain in Camp I to wait out the storm, hoping that the following day wouldn’t be too windy and that we could get to Camp II taking turns breaking trail through the new snow. We eventually realized, however, that we had already been to Camp II (but not slept there yet) and that if we couldn’t make it to Camp III the following day, it would be a waste of fuel and food to climb to Camp II to sleep this cycle (as we would have to climb to Camp I, sleep, climb to Camp II, sleep, and climb to Camp III and descend the following cycle regardless of whether or not we had a night in Camp II this cycle). We made the decision in the afternoon after witnessing non-stop snowfall all day that we would descend early in the morning the following day. We wanted to get down early as there were supposed to be high winds and combined with the large accumulation of new snow, we were concerned about avalanche risk on the route to Base Camp. In the late afternoon, I ventured outside my tent to remake the tent platform and reinforce my tent anchors in preparation for the week of high winds scheduled to begin tomorrow afternoon. Today, Ryan, Badia, Mauricio, Lina, Javi and I woke up at 4:00am, packed up our things, and ate breakfast in the mess tent. We left around 5:30am for Camp I, taking advantage of the cooler temperatures of the early morning. We quickly made our way across the moraine and climbed up the steep section below the traverse, making good time. 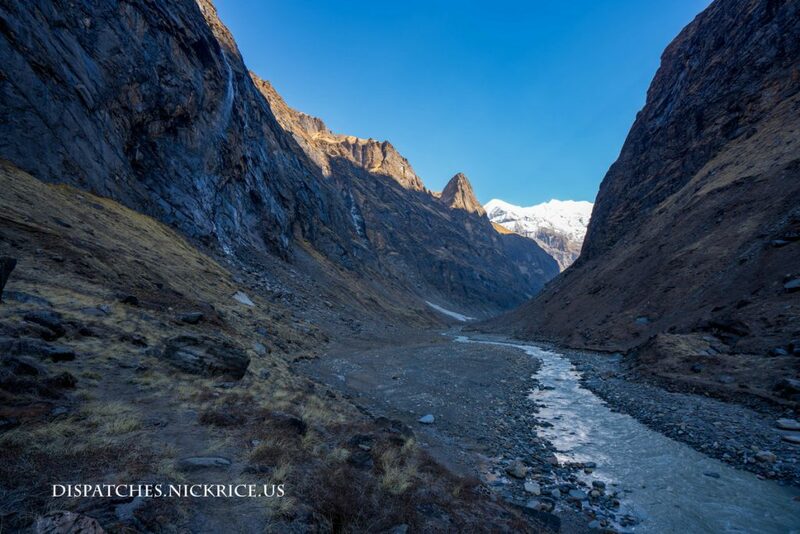 The sun began to shine on the glacier and our pace slowed as the temperature rose to 40C or 104F. I was relatively impressed with my leg as I was carrying a 23kg backpack and was climbing on complex terrain with little pain. We eventually made it to Camp I, quickly getting inside our tents to escape the direct sunlight as some weather made its way into camp. I made water and had a small lunch. We all watched as snow began to fall in the afternoon. We were concerned as one of our weather forecasts called for heavy snow the following day, while the other called for 2-4 inches. We discussed our plan in case of heavy snow, and decided to remain in Camp I for the day and continue up to Camp II on Friday morning. Today, we woke up early, witnessed an enormous avalanche sweep across the valley, affirming our decision to push off our departure a day, and had breakfast in the mess tent. We spent the morning getting in some exercise, walking up the glacier a bit. After this, I visited with Rosa Fernandez, then had lunch. Afterwards, the Chileans returned from their excursion up on Dhaulagiri. We spent the afternoon resting for our early departure tomorrow morning. 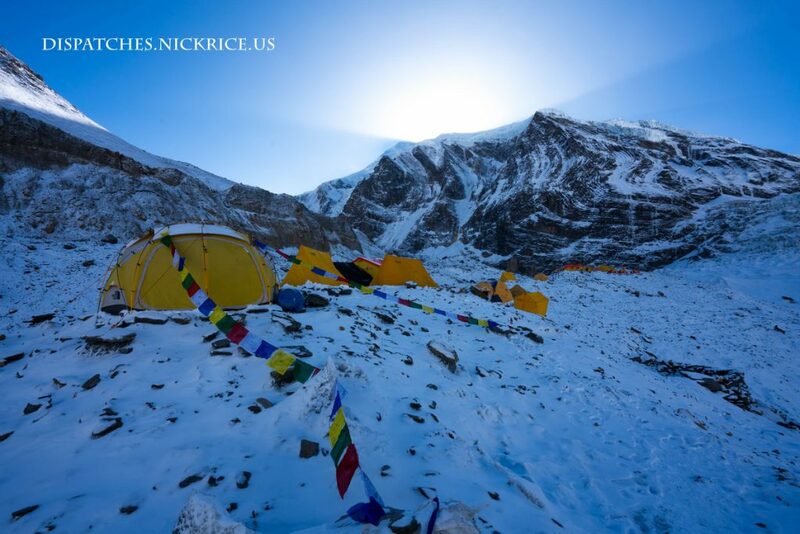 We plan on climbing to Camp I tomorrow, Camp II on Wednesday, sleeping in Camp II, then departing in the early morning hours of Thursday to ascend to at least 7000m on the way to Camp III before descending to Base Camp. After this, we should be ready for our summit bid. Today, I woke up to the sound of a helicopter flying over my tent. I went up to the helipad and we watched as the helicopter made trip after trip up the mountain to look for Simone’s body. We all hoped that by some miracle, he was still alive with maybe broken limbs that prevented him from contacting base camp. 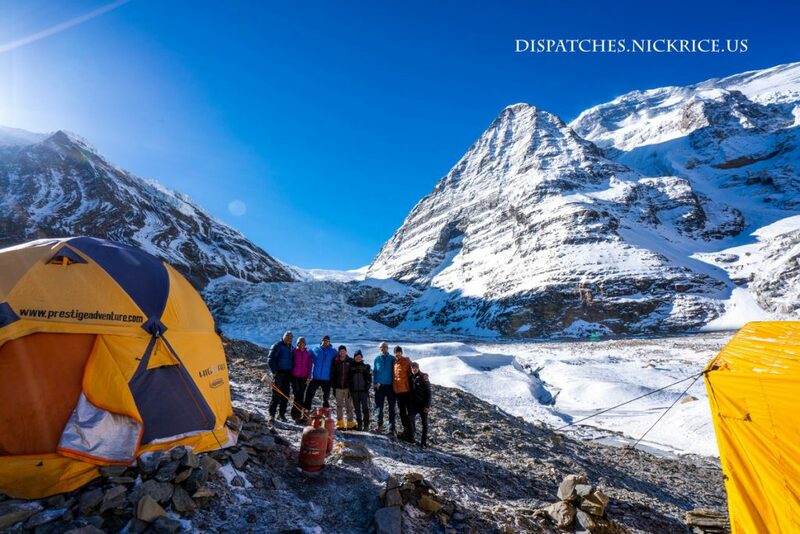 He was after all in his tent with a sleeping bag and stove, so there was some remote possibility that he may still be alive despite spending more than 24 hours injured on the mountain (think Beck Weathers on Everest). After a few trips, the helicopter dropped off his sleeping bag. The next time, it brought his very unique gore-tex jacket, which had blood stains on it. 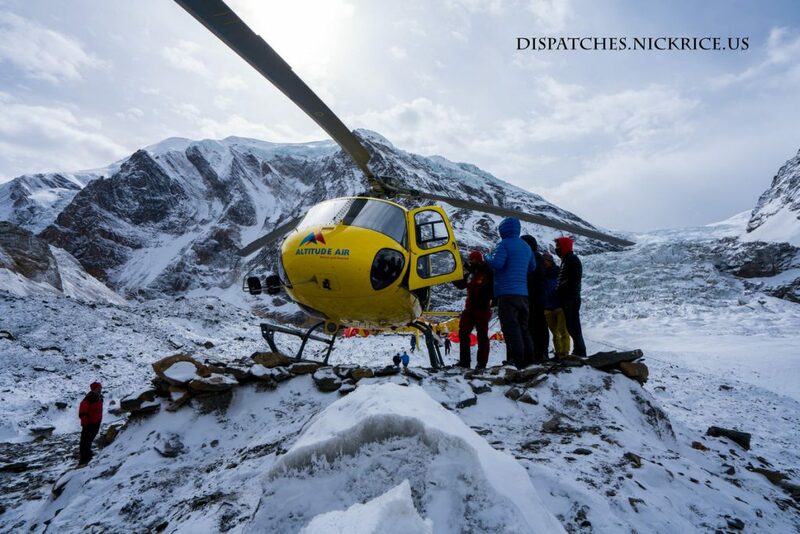 Finally, with Alex Gavan inside and with the help of a Sherpa, Simone’s body was brought down by helicopter. 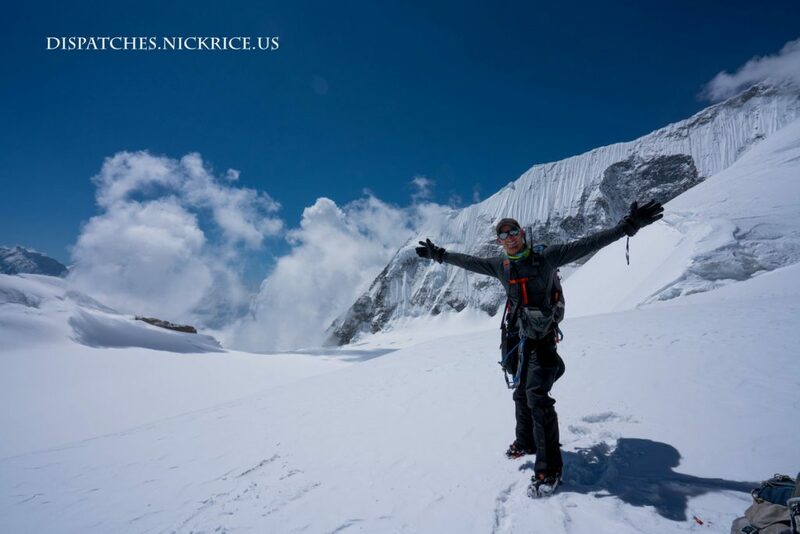 He was found just above the altitude of Camp I under a dangerous serac. Alex and I broke down momentarily as our hope of his rescue came crashing down. Alex contacted his wife and broke the news to her. 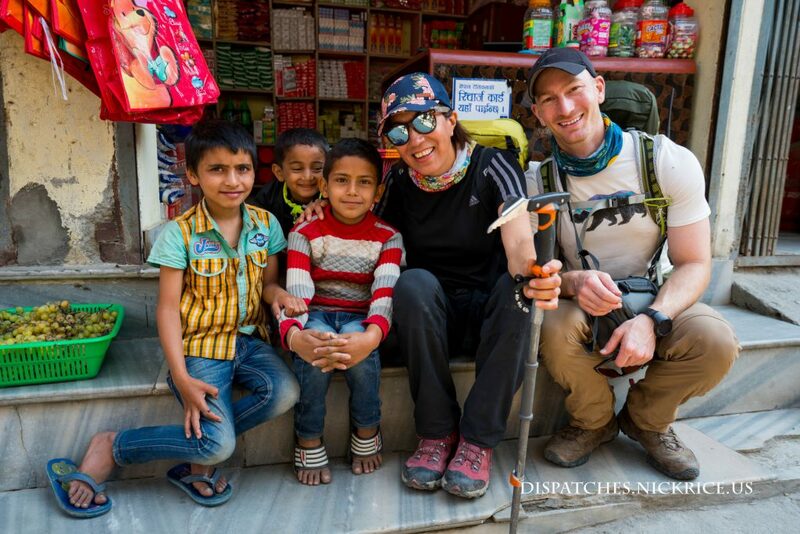 We all returned to our tents as Simone’s body was taken down to Kathmandu in the helicopter. We ate lunch, and I spent the afternoon with Alex as he worked through the traumatic events of the day. 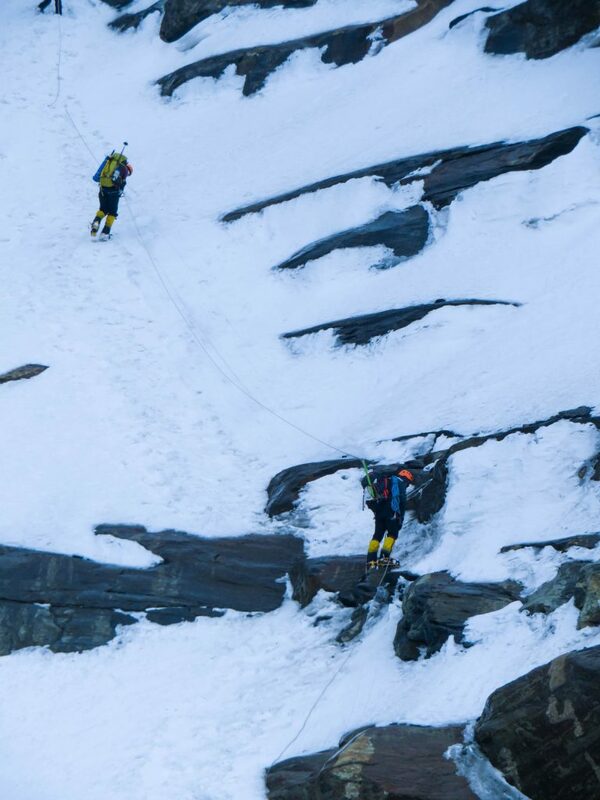 He took an enormous risk exiting the helicopter underneath the very dangerous serac in order to recover the body of Simone, but we do these things for those we care about. Ryan and I kept ourselves busy in order to avoid having to feel the devastation of losing a good friend. We sorted through equipment for our next acclimatization cycle up to Camp III. The weather has been unstable, alternating between heavy snow and high winds, so we are working on a plan to get up high with as little risk as possible. Heavy snow began to fall in the afternoon and continued to fall all evening. We ate dinner in the mess tent, then I went over to Alex’s tent to work with him a bit. We pushed off our acclimatization cycle a day thanks to the heavy snow accumulation. The helicopter that worked on Simone's rescue. Today, after hearing the Chileans and Chris depart in the early morning hours, my tent was shaken loudly by our base camp manager around 6:00am. He came with bad news. 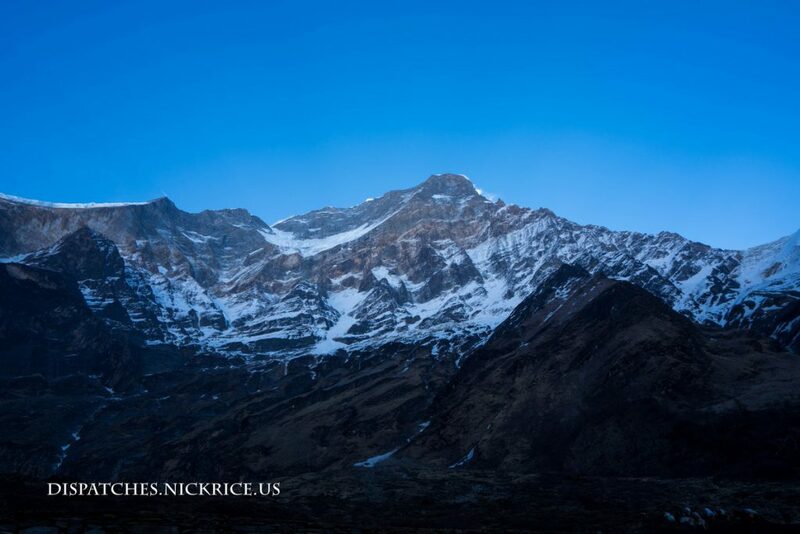 Late yesterday, Simone La Terra was swept from a lower bivy between Camp II and Camp III. 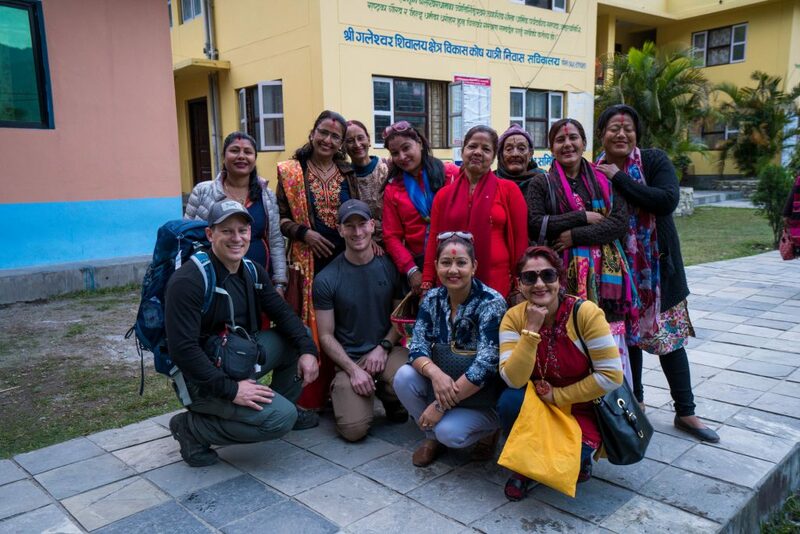 I immediately got dressed and went up to the Seven Summits Camp where I spoke with Rosa and some of the Sherpas about what had happened. Simone had decided to pitch a tent below the normal place where Camp III is located. He chose a location on the ridge for his tent platform, and as he was taking shelter in his tent, a strong gust of wind blew him and his tent off of the ridge with him inside. 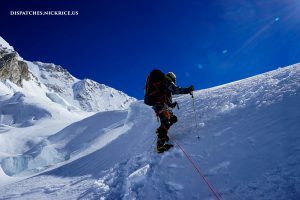 Simone fell a significant distance before coming to a stop just underneath a serac (his final location was not known at the time). 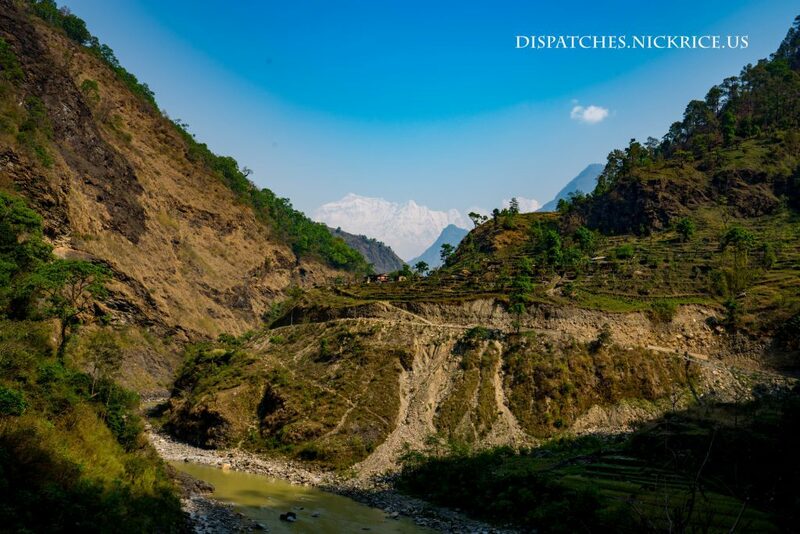 I returned to our camp and we advised Parajuli. 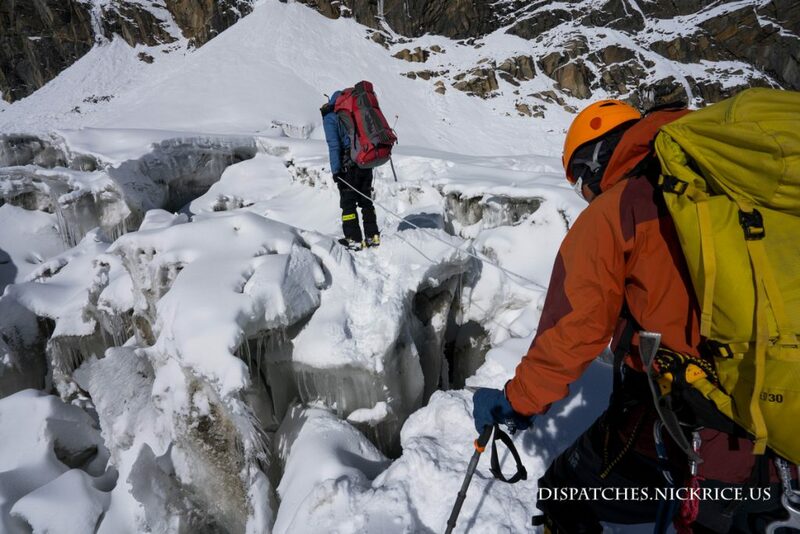 He was not satisfied with the information that we had in base camp and wanted to wait for more concrete information about Simone’s location before sending a helicopter for rescue. Later in the morning, we spoke with Chris in Camp I. He advised us that Alex Gavan had arranged a rescue effort and that the helicopter was inbound. The weather moved in, as had been forecast, and we all moved inside as we tried to put together exactly what had happened. The helicopter was unable to make it to Camp I in this weather, so it stopped in Italian Base Camp for the night so as to be poised for a rescue effort first thing in the morning when the weather is normally clear. I’ve known Simone since 2007 and consider him to be a close friend and part of my climbing family. We climbed together most recently on Gasherbrum I in 2015 and on K2 in 2016. 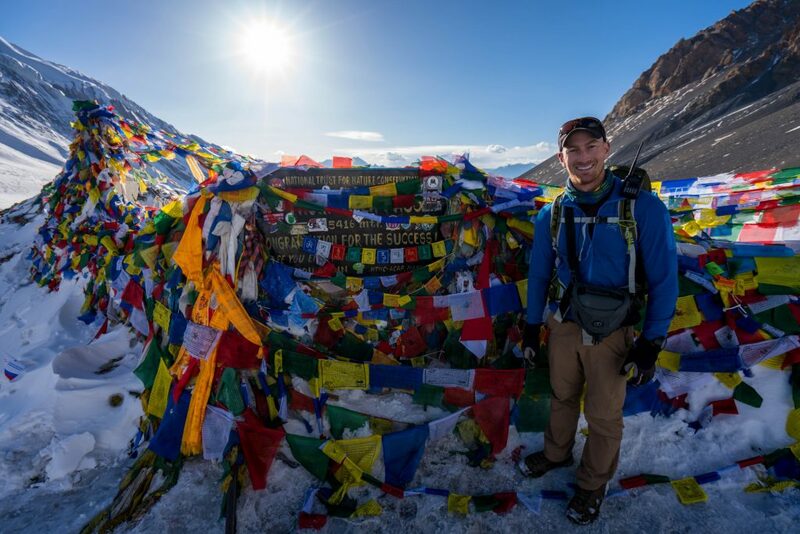 He was always cheerful, generous, caring, and the life of base camp, as his jubilant personality always brought a smile to everyone’s face. I take solace knowing that he died doing what he loved most in the world; climbing. Lina and Javi arrived from Camp II to base camp just before lunch time. We gathered for lunch, during which we spoke fondly of memories of Simone. 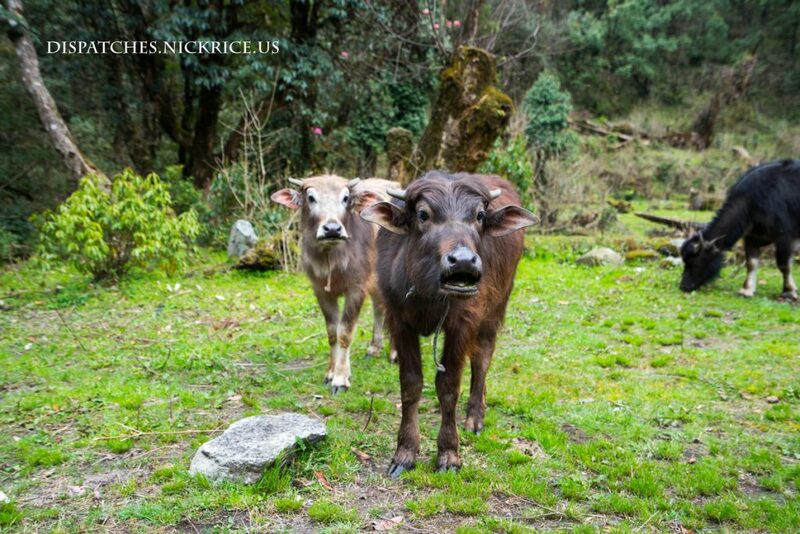 In the late afternoon, to distract ourselves, Badia, Mauricio and I went up to Carlos Soria’s camp to speak with his doctor. He examined my leg and said he was sure it wasn’t broken or fractured and said that it most likely was a strain of a tendon, ligament or muscle. 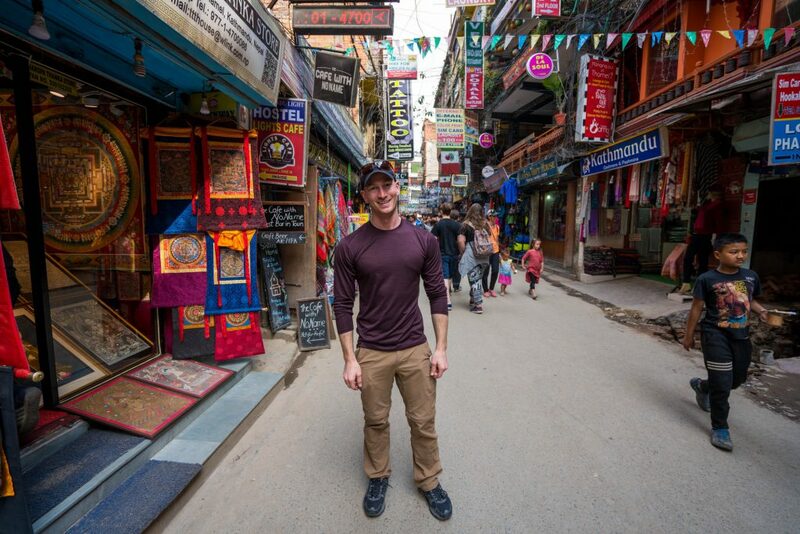 He said he would prefer that I take one more day of rest before beginning my descent but said the injury shouldn’t prevent me from completing the expedition. 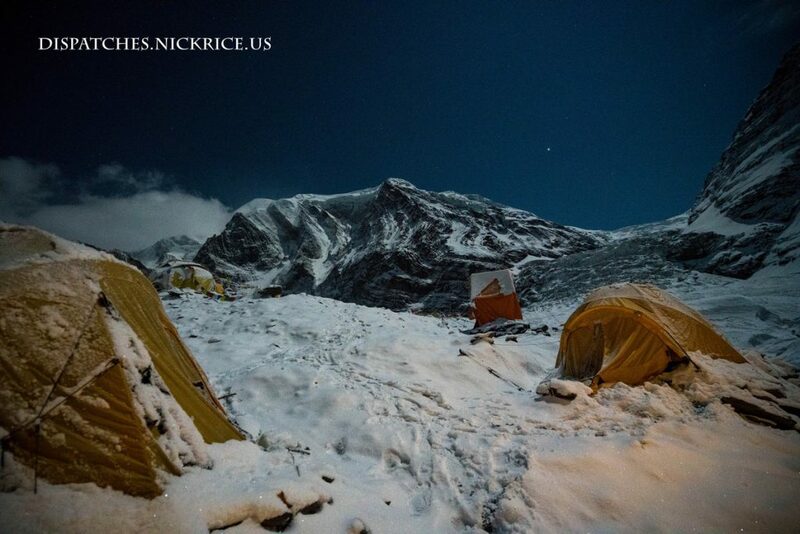 We returned to our base camp, had dinner, and spoke at length about our plans to go up the following morning. Since heavy snow had fallen most of the day, and considering the events that had occurred so recently, we made the decision to postpone our ascent to Camp I until Tuesday, to allow the mountain a day of good weather to clear excess snow. RIP Simone La Terra. 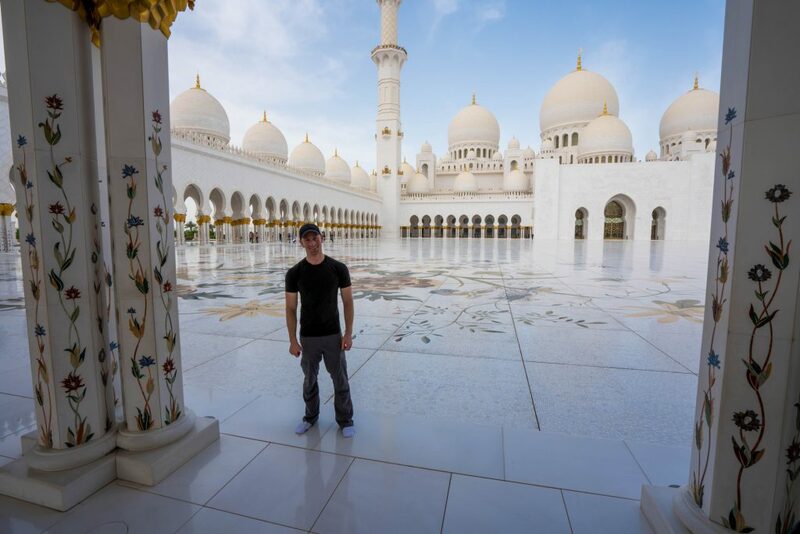 You will live on in our hearts. Today, we woke up to a clear morning with a blanket of fresh snow covering base camp. Chris decided not to go up late last night due to the heavy snow. He will begin the climb to Camp I tomorrow instead. We witnessed an enormous avalanche come down the mountain in the afternoon, the wind blast dusting base camp in snow, and another from Mahabharat Lekh in the evening, which thankfully took a detour around base camp, though the wind blast did blow our tents around. 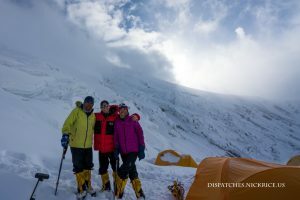 Today, after a very good night’s sleep, I woke up around 7:30am, cleared the snow off of my solar panels, and watched as an enormous avalanche swept very close to the route to Camp I. Thankfully, we had advised Lina and Javi to leave very early in the morning for Camp I and we were confident that they were well past the place on the route that was at risk of being hit by that time. We ate breakfast together, spent the morning organizing and visiting with Dhaula, and again witnessed the afternoon storms materialize. 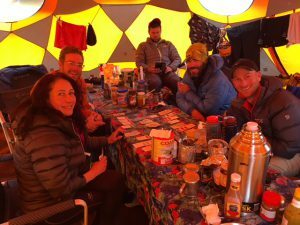 We watched Office Space and played Monopoly Deal in the mess tent to kill time in the afternoon, and then I spent the remaining time before dinner organizing my meals for our next acclimatization cycle. We enjoyed a filling dinner (not something that we usually get this year), spoke with Lina and Javi in Camp I, and went to sleep as heavy snow fell. Today, I woke up at 8:00am, iced my leg, took another NSAID to reduce swelling, and hobbled over to the mess tent for breakfast. My leg felt a bit better in the morning, which gave me hope that it would recover before the next weather window for our upcoming acclimatization cycle. We all showered, ate lunch, and watched as our weather forecast materialized with snow in the afternoon. Dhaula (the dog) showed up in the afternoon, whimpering with excitement when she saw Eva and I. I spent the remainder of the day organizing gear for our upcoming climb to Camp III, maintaining optimism that my leg will heal and that I will be able to continue my expedition on Dhaulagiri. 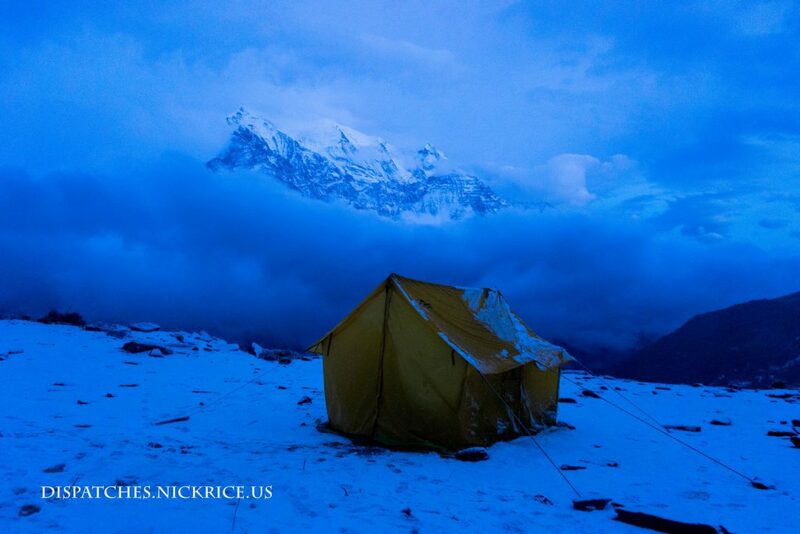 Dhaula spent the night in Eva’s base camp tent’s vestibule, sheltered from the snow. 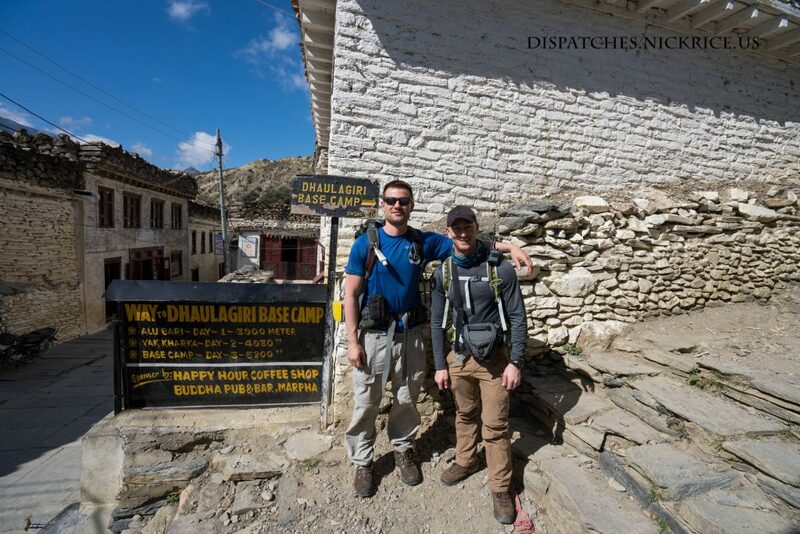 Today Ryan, Badia, Mauricio, and I woke up at 6:00am, made water, ate a small breakfast and began the long descent to Base Camp. Due to my injury, I was extremely slow and was fortunate to have such patient climbers around me. Ryan broke trail through the new snow, while Badia walked just in front of me. 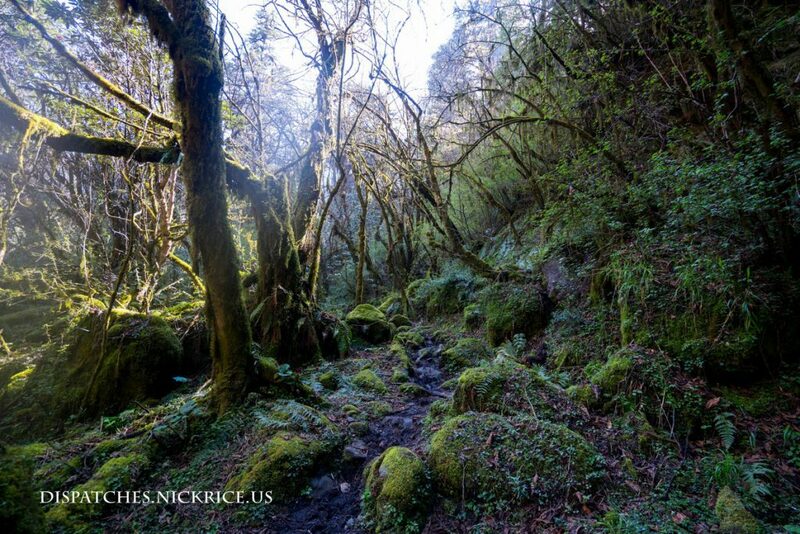 Mauricio took my backpack and walked just behind me and we made steady but slow progress down to Base Camp. I hobbled down and after more than 5 hours, made it back to the relative safety of Base Camp. I had lunch and unpacked my equipment while the weather deteriorated. After dinner, Nico, the Chilean doctor examined my leg. He seemed confident that it was not broken or fractured and said it should get better in a few days. If it got worse, he would again become suspicious that it was fractured, but for now, since I was able to make it down from Camp I on my own, he doubted that it was fractured. I took another NSAID and iced the leg before bed and turned in for the night.